Each year, many patients worldwide are confronted with a diagnosis of “peritoneal cancer”. This includes patients with rare diseases such as malignant mesothelioma and pseudomyxoma peritonei (PMP). 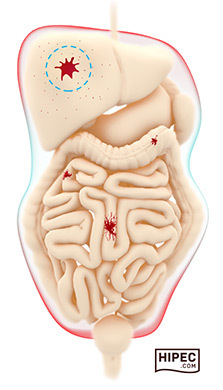 More often, peritoneal cancer arises from metastases from a cancer elsewhere in the body. Not so long ago, peritoneal cancer was very hard to treat and the prognosis for these patients was very poor. Fortunately, the treatment for patients with peritoneal cancer is evolving and improving. Treatment, which may include HIPEC in select patients, is challenging and complex. Optimal treatment ideally requires a team of medical specialists having expertise in peritoneal cancer and HIPEC surgery. This website aims to inform patients and physicians about peritoneal cancer and possible treatment. One of these treatments is the surgical removal of all visible tumor in the abdomen followed by a “bath” of heated chemotherapy. In medical terms this is referred to as cytoreductive surgery (CRS) and hyperthermic intra-peritoneal chemotherapy (HIPEC).